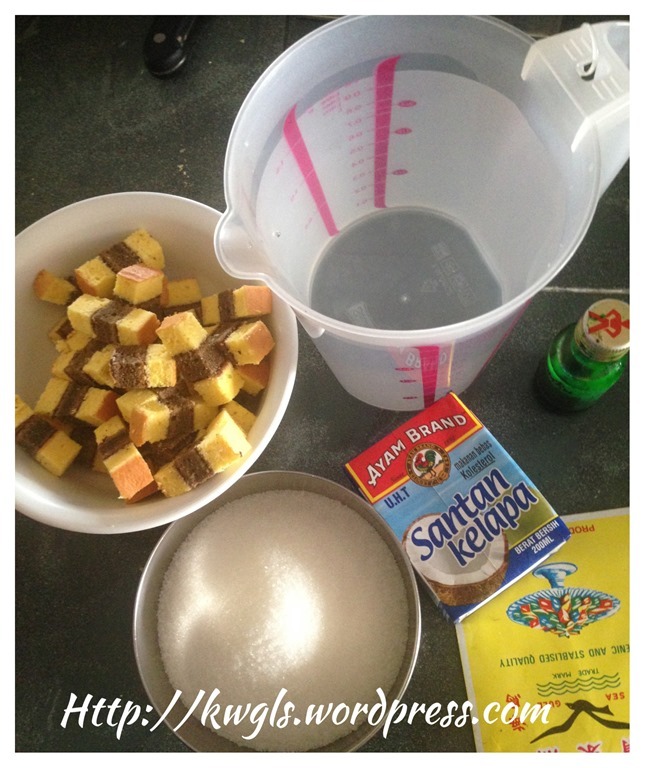 This will be a short post and with no fixed recipe.. 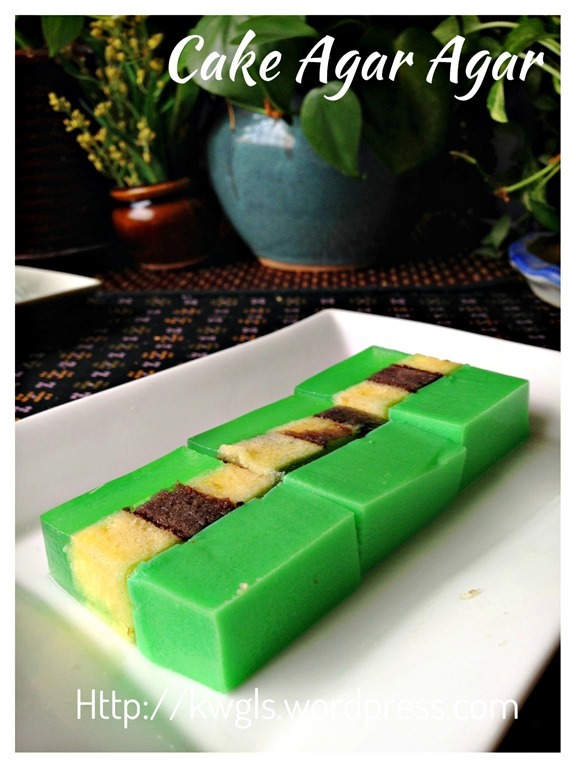 I am sharing more of a concept than a recipe because it is a way of getting rid of stale cake and it very much depends on what you have and your creativities..
For the cake, you can use any stale cakes such as sponge cake, butter cake, chiffon cakes and etc.…. 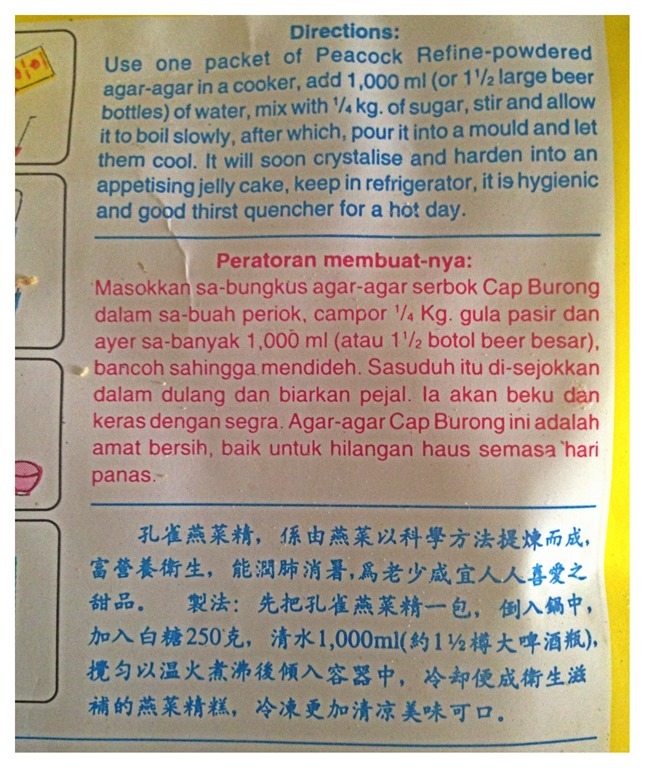 and for the agar agar, I will advise you to follow the packaging instruction. Every brand of agar agar will have the instruction as in the package and it is the most accurate recipe for agar agar in my humble opinion. 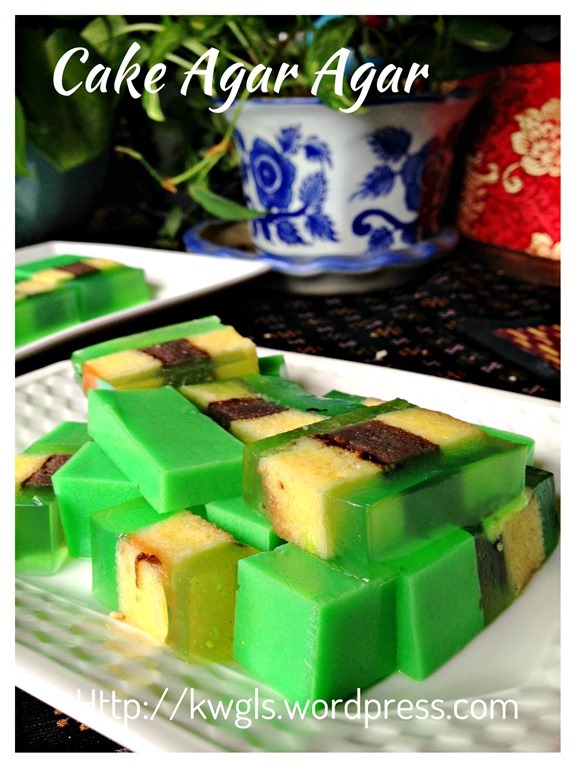 You can always have agar agar of your preferred flavour. 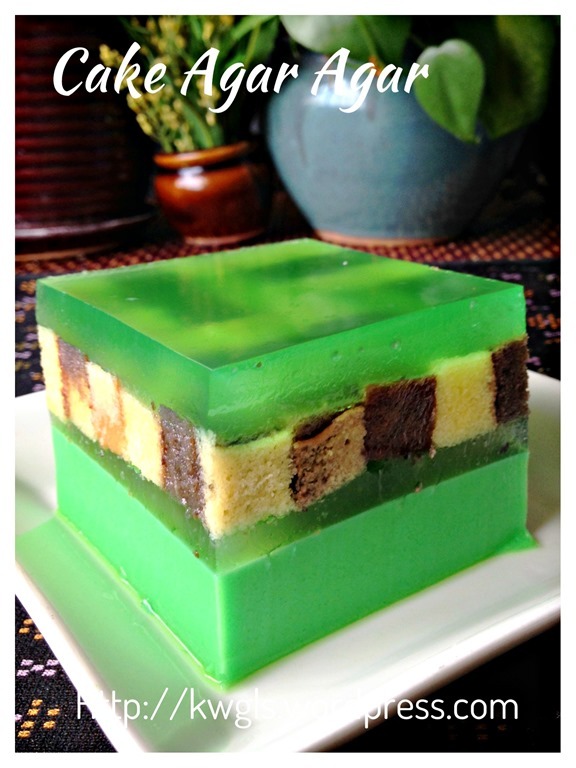 I am not the one who created this cake agar agar.. 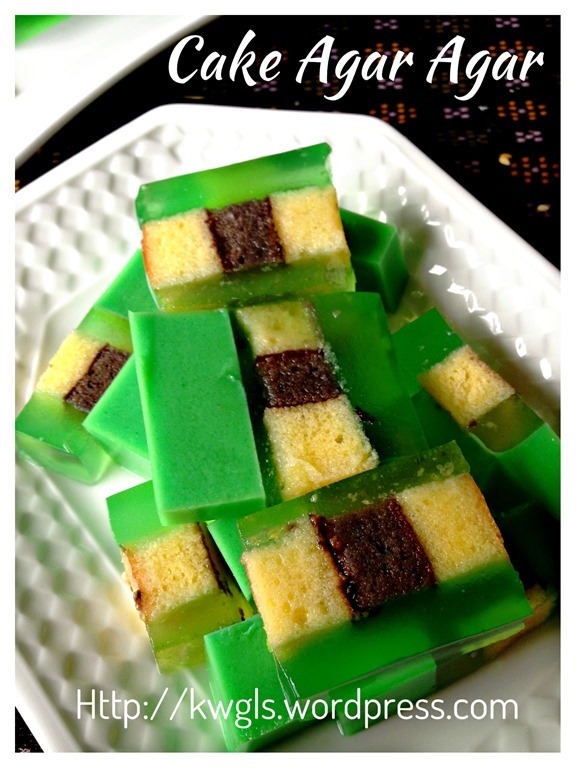 It is a common practise when I was young where stale cakes were cut into pieces and agar pour on top of the cake.. 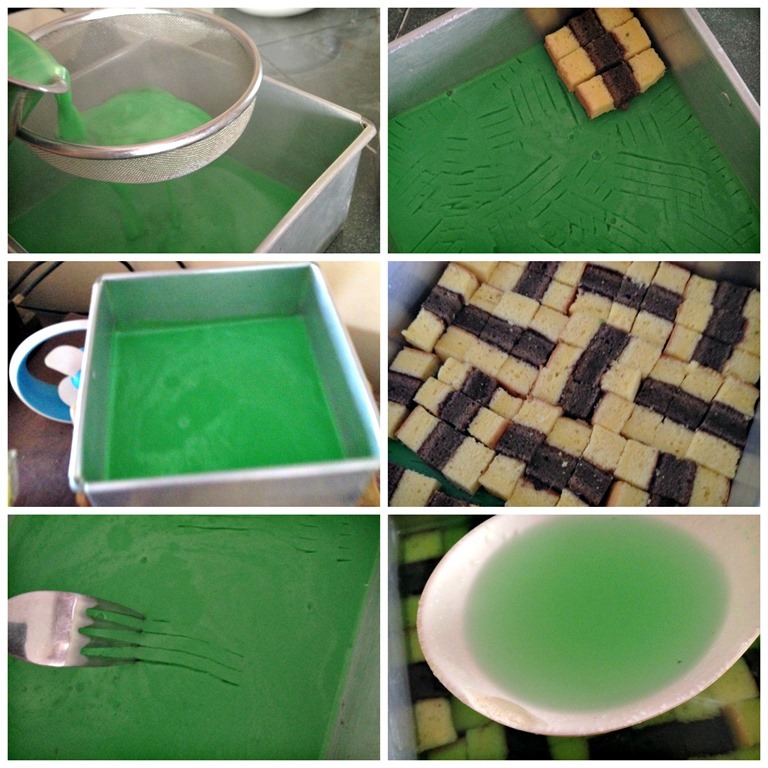 Since I have some stale cakes left, I have decided to share with readers how I did this cake agar agar.. 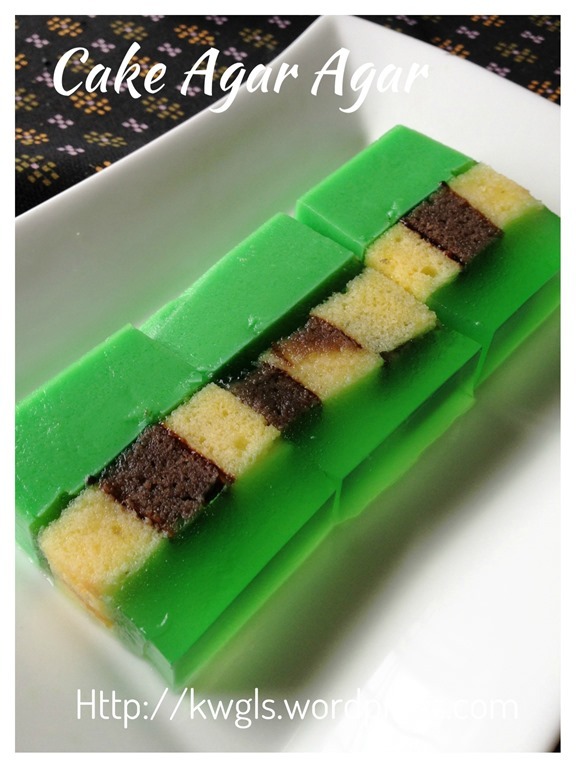 Remember, as this cake agar agar was prepared based on stale cakes, it was rather impossible to have one nicely laid out cake unless you purposely prepared a cake for the agar agar. 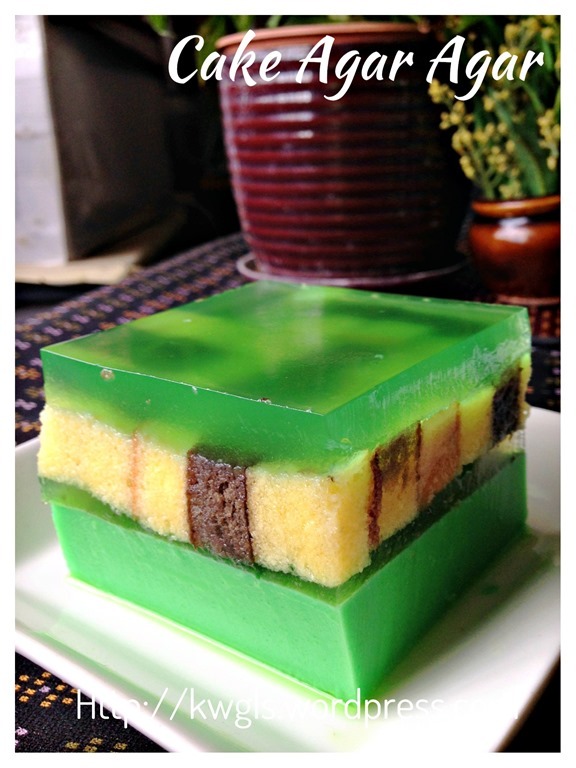 That, in a way defeat the purpose of this agar agar cake, but of course you can do it if you would like to present this cake as a gift or turn into certain celebration cake. Traditionally, it was the sides of the cakes that are dry or cakes that have been kept for 3-4 days. This is what I did. I gathered all the ingredients required as the packaging instructions and i have decided to add coconut milk to one portion of my agar agar. 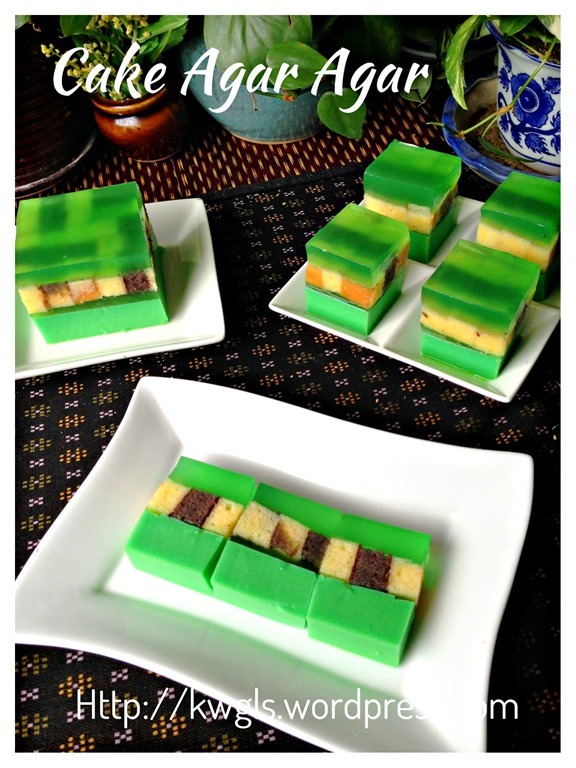 The ingredients are stale cakes, sugar, pandan paste, coconut milk and water. Because I wanted to add coconut milk, i have to less out the water used as per the packaging instructions which was 1 litre. Instead of using 1,000 ml water, I have used 800 ml of water and 200 ml of coconut milk. 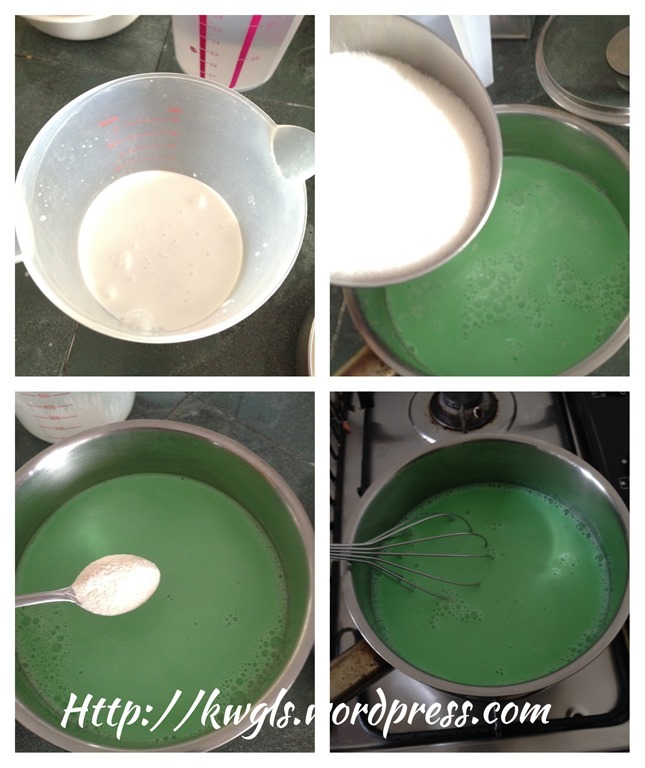 I then add pandan paste, sugar and the agar agar powder. Bring the agar agar to boil under medium heat Once boiled, off the heat. I then transferred the agar agar to a 6” square baking tin and let it cooled in front of a fan to expedite the process. Once it was set, I used the fork to lightly make some scratches in the top layer and started to line the cake in my preferred design. Meanwhile, I prepared another batch of agar agar as per the packaging instruction. Once it was ready, I carefully pour on top of the staled cakes. Let it cool completely and chilled in the fridge for about 1 hour before I cut the agar agar. The above is what I did… Variations are so many that I do not think I should provide a fixed recipe. 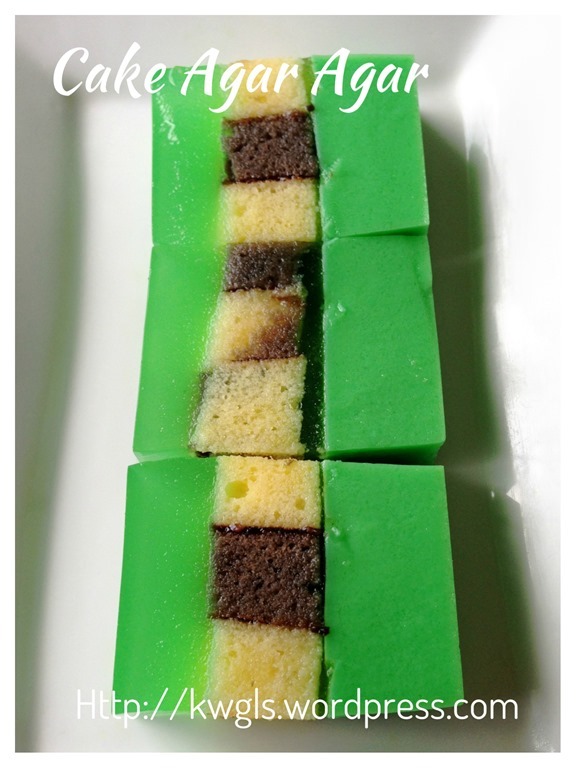 You can always use your creativity based on the cakes you have, the type of agar agar flavour you want and the colour of the agar agar.. You can then do layering and lining of cake based on your design.. Some pre-planning on the colour and layering is required to ensure that the output is as per what you have like to see.. 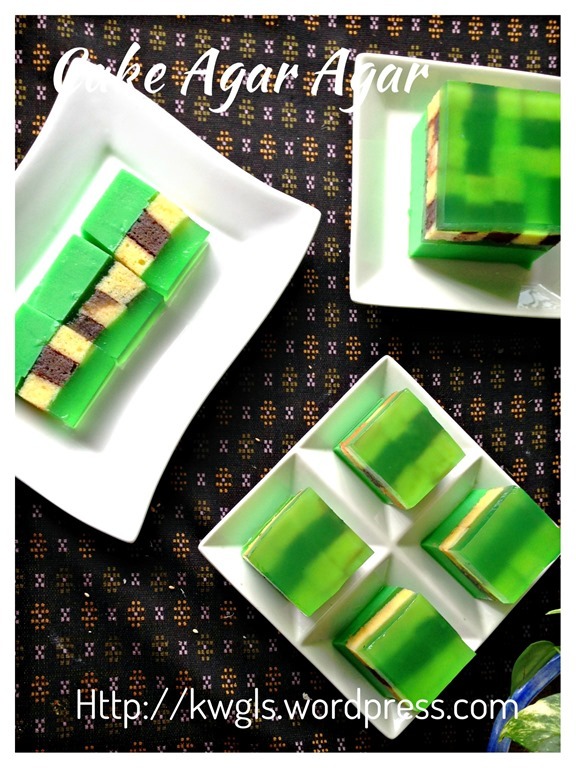 If you are not keen on designing the cake, trust me, just pour some agar agar on the stale cakes and the taste is fabulous as well. If you wish, add some fresh or canned fruits…The only thing is that the cake will float on the top but our elders are having this all this while and nobody complained … At least you managed to get rid of some stale cakes right? Is it not good not to waste any food? 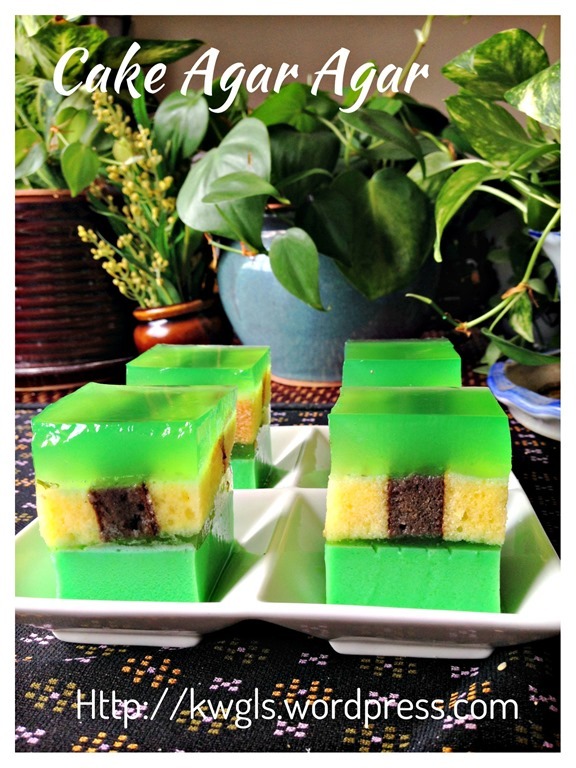 If you like to learned more about what is Agar Agar and the use of dried agar agar seaweed, you can refer to this post: Agar Agar is not the same as Agak Agak… Agar Agar is Red Algae !! 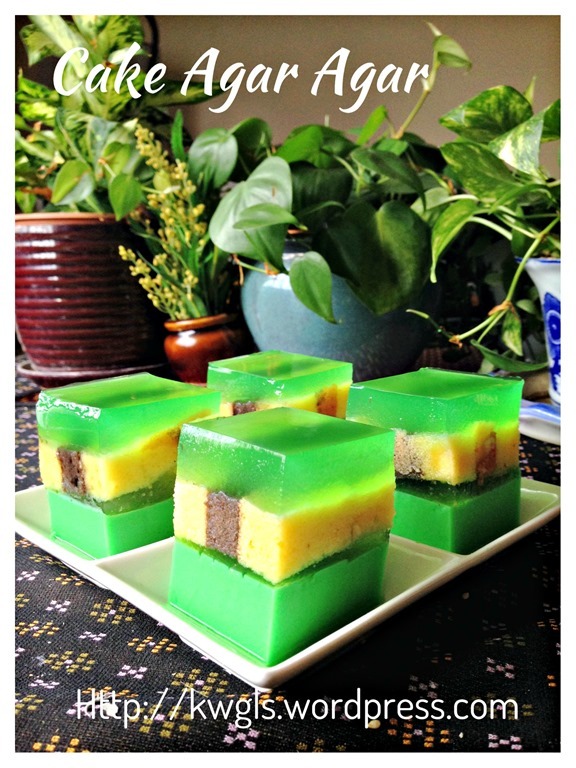 This entry was posted in Desserts, Food Preparation Series and tagged 8, agar agar cake, cake agar agar, 燕菜蛋糕, 蛋糕燕菜, GUAI SHU SHU, Guaishushu, kenneth goh, postaday, stale cake. Bookmark the permalink. Hi Kenneth, may I know why you scratched the top layer? Thanks.